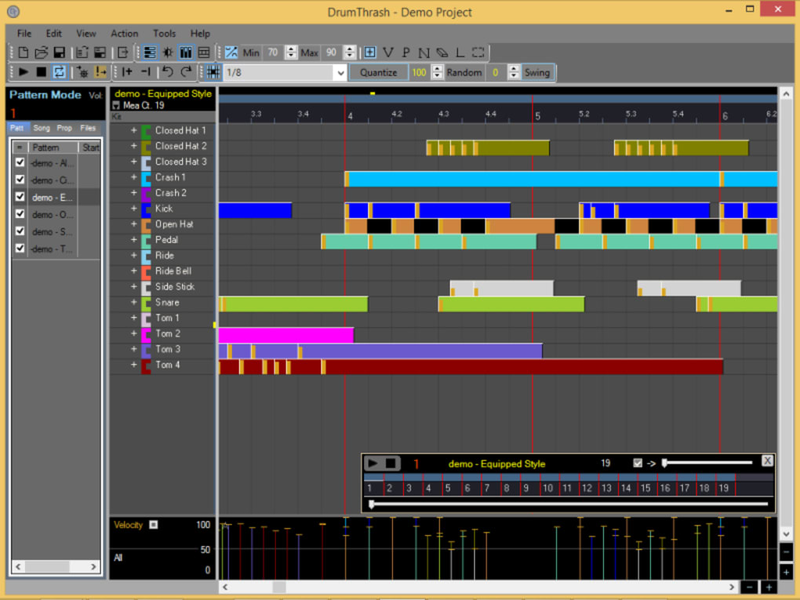 Drum machine software for producing realistic sounding drum tracks. DrumThrash is a standalone drum machine software for PC that lets you create realistic sounding drum tracks. Easily compose full length drum arrangements for any style rock, jazz, metal, funk, country, hip-hop, etc... Many advanced options while still providing a simple layout. Create backing tracks to jam along with on your guitar, use it as a metronome to keep yourself in time, or use it in live performances. Some of the features include multi-layered sample support allowing for a random sample to be chosen for each hit. Supported audio - wav, mp3, or ogg. Complete velocity and pan control for all groups' samples and hits. Set velocity ranges and have DrumThrash pick a random velocity for each newly placed hit. Create virtually any timing. Add tempo changes at any division to create odd time signatures. Easily change straight beats to swing. Easily humanize your patterns using the quantizing tool along with the random tick option. The automatic choking feature lets you assign any sample or group to cut-off another sample or group. DrumThrash also includes a complete high quality drum sample pack with extra hi-hats, kicks and snares so you can swap samples out to give beats a different feel. What do you think about DrumThrash? Do you recommend it? Why?